Keeping up with the needs of the customers in your supply chain is an ever-escalating challenge. Constantly buying new forklift batteries and chargers to meet short-lived busy seasons isn’t always practical. So, what are your alternatives? You could buy used forklift batteries and chargers, or use rental equipment to meet short-term demands. 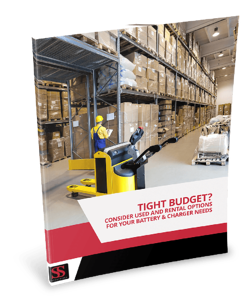 Download our guide now to learn more about when and why you should rent or buy used forklift batteries and chargers, as well as the benefits of doing so! Fill out the form below to get the guide!